Most experts agree that the earliest examples of farming and animal domestication lie in the aptly named Fertile Crescent, in present day Iraq. But still many questions have lingered over the years, especially with regard to remnants of farming or animal domestication that have not survived to the present day. 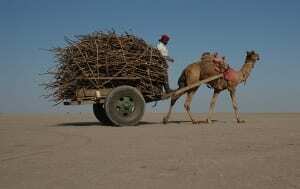 What kind of tools did they use to farm the earliest crops? How did they transport these crops to neighboring communities? Now a new archaeological discovery in the mountains of Turkmenistan has finally given us more answers than questions, and has shed light on some of earliest farming communities in western Asia. The finds center around the discovery of several model-sized carts at the archaeological site of Altyndepe, a Bronze Age settlement near the city of Ashgabat in southern Turkmenistan. These tiny carts may have been used in ritual ceremonies, or may have simply been the toys of young children. But the most interesting aspect of these carts is that they depict camels as the main beasts of burden. Archaeologists are always interested in artifacts that reveal clues about daily life from ancient civilizations, and these camel-pulled carts are a comparative jack-pot. An article about the carts recently appeared on the Discovery News website. They were documented by Lyubov Kircho of the Institute for the History of Material Culture at the Russian Academy of Sciences and are described (in Russian) in the journal Archaeology, Ethnology and Anthropology of Eurasia. An English version will be published in the Proceedings of the 19th International Conference of the European Association of South Asian Archaeologists. Archaeologists have discovered cattle-pulled carts from the region, dating to about 6,000 years ago. These carts were originally used for transporting necessities like grain, but later carried other items like alabaster and the prized stone lapis lazuli from hundreds of miles away. Trade networks with neighboring communities began to spring up, and by 3,500 BC one of the first dedicated ‘highways’ for vehicles ran between Altyndepe and nearby towns in present-day Iran and Afghanistan. But by 3,000 BC, the climate was becoming more arid and the people of Altyndepe could not longer trust their cattle-pulled carts to make the long journeys. Archaeologists already suspected that the communities must have switched to camels, which were better able to handle the drier climate. Now these model carts show that their suspicions were correct; camel-pulled carts were the standard for this region, and were such an integral part of daily life that miniature versions were created as children’s toys. The presence of these carts – combined with previous ideas on the sharing of ideas and culture throughout this part of western Asia – also have implications for the genetic history of the region. It is well documented that about 10% of modern Europeans contain a genetic signature of the early agriculturalists who arrived from the Near East beginning about 9,000 years ago, bringing their farming techniques and DNA with them. Scientists now believe that while some of these Near Eastern farmers did travel west into the heart of Europe, others headed into the plateaus and foothills east of the Caspian Sea. Like their western counterparts, these farmers brought their farming tools and techniques to the indigenous people of southern Turkmenistan. And like their western counterparts, they probably brought their genes. In fact, some genetic studies have examined the genetic make-up of modern day residents of Turkmenistan, and have found that many of these people also bear the genetic signatures of the early farmers of the Fertile Crescent.